MainAll NewsInside IsraelAre police afraid of Itamar Ben-Gvir? 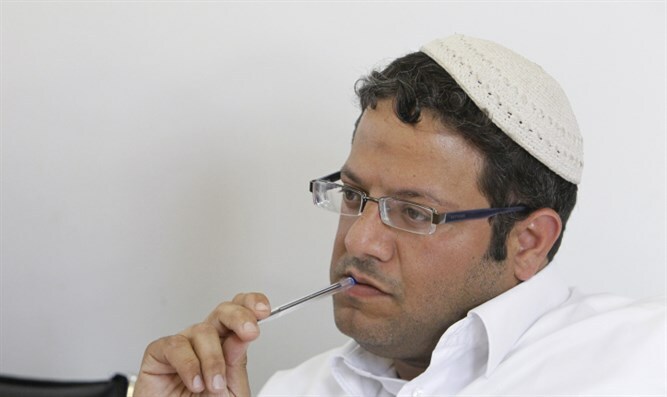 Are police afraid of Itamar Ben-Gvir? Attorney Itamar Ben-Gvir took action after police refused him and his son entry to the Temple Mount. This Wednesday, the attorney Itamar Ben-Gvir, known for representing Jews accused of nationalistic-related offenses by the state, arrived at the Temple Mount in Jerusalem with his family. Before he ascended the Mount, though, police blocked his entry. The policeman on duty would only agree to Ben-Gvir's entry if he signed a statement to not "cause provocations on the Temple Mount." Concurrently, Ben-Gvir's eldest son Shoval Tzadok arrived to the entrance of the Temple Mount, along with friends from a youth group called "Returning to the Mount." He wore a t-shirt, which had been prepared for his father's birthday, which bore the words "My father is an awesome lawyer." Police refused to let Shoval into the Temple premises while wearing the shirt, only allowing him to do so once he changed clothes. Several hours later, Ben-Gvir wrote a letter demanding monetary compensation from the Jerusalem District Police, emphasizing in his letter that the police were working to counter an incident several months back - in which the courts ruled in Ben-Gvir's favor. In that incident, Ben-Gvir had entered the Temple Mount and, in response to shouts from the Waqf (Jordanian representatives who possess de facto control of the Temple Mount premises) of "Allah is great," had shouted back "The nation of Israel lives!" The court had refused to distance Ben-Gvir from the Temple Mount on grounds that he had committed no crime and, on the contrary, had ordered the Waqf to pay Ben-Gvir fifty thousand shekels. Ben-Gvir asserted in his letter this week that the decision not to allow him onto the Temple Mount is a severe attempt to override the previous court decision, which was in his favor. Ben-Gvir also protested the police action which barred his son from entering the Temple Mount with the special t-shirt. For all this, Ben-Gvir demanded monetary compensation from the district command to a tune of ten thousand shekels, and emphasized that this letter should be treated as a warning before a law suit. Several hours after receiving the letter, the chief attorney of the Jerusalem district command announced that there had been a mistake, and that Ben-Gvir would be allowed onto the Temple Mount without having to sign any document. The Jerusalem Police chief attorney said that the police would investigate the policeman who had blocked Ben-Gvir's son. However, Ben-Gvir's request for monetary compensation was rejected. "The police freely breaks the law on the Temple Mount, thumbing their noses at the decisions of judges who ruled that my actions contained no fault, and trying to turn my actions into crimes," Ben-Gvir said. "It's good to hear that the decision not to allow me entry to the Temple Mount was a mistake, as was established by the learned chief attorney, but it seems to me that the rejection of my monetary compensation is unjust, and I will consider a law suit. "The police hurt me, caused me damages, hurt my son Shoval, and took away our freedom of movement, one of the fundamental principles of a democratic society," Ben-Gvir emphasized.